I used to be a bit intimidated by Indian cooking, but since we moved to a town that has NO Indian restaurants (yes, you read me correctly, and yes, it makes me miserable), I started to cook at home. Not sure I do a great job, but little by little I’m getting more comfortable. I absolutely love Indian food, but never think to cook it at home! This post was great inspiration to get on changing that ASAP! This looks wonderful and just the answer to my question to myself this morning – what am I going to make for dinner using the cauliflower I have in my fridge. Perfect. Yum! This is one of the easiest ones I’ve seen so I’m really excited to give it a shot. Do you have a mango wala type recipe that you love? That is one I’ve been searching for without any luck (nor satisfaction at my several attempts). I couldn’t agree more! Indian food usually looks so scary at first glance, but once you have the basic ingredients it’s super adaptable. We make Indian food a lot at home and can’t get enough of it! Excited to try this! Given that I actually DO have all the spices, it’s pretty ridiculous that I don’t make indian food more often when I love it so much! This post was definitely inspiration to get it on my menu plan! I LOVE Indian food, but I don’t make it much at home — not because of spices — but because of rice. I haven’t perfected the art of perfectly fluffy basmati rice. Do you have any special tips, Dana? Do you use a rice cooker? Love it and this recipe sounds fantastic. What great tips to get people cooking this amazing cuisine. I also LOVE The Bengali Spice Chronicles. I reviewed it on my blog a while back. Yum! I love Indian food and make it often. A few years ago, I asked one of the parents I know from our school if I could watch her cook some time and she said yes! I took notes while I watched and came home and experimented. It was a great way to learn and watching her made the process less intimidating. She also explained the balance of the spices and some of the spices medicinal properties. Dana, I’m always happy when you invite us into your kitchen! Rose – I love Tilda brand rice – basmati imported from India. It’s sold in a gorgeous blue sack with a peacock on it. I first learned about it from Nigella Lawson. Easy! First, rinse well & drain the rice three times. Then presoak a bit with the following proportions – 1 part rice to 1.5 part water. I usually add a few bay leaves, fresh curry leaves if I have them, six green cardamom pods, and sometimes a cinnamon stick or two. After presoak, cover pan, bring to boil, then adjust burner to lowest setting, cook for 20 minutes. I think the best pan to use is your widest one. And one with a good tight-fitting lid. After your timer goes off, let the rice sit for 10-15 minutes or so – you can even slip a clean tea towel under the lid during this time if you like. Then gently fluff up the rice with a fork & enjoy! Tilda rice has the most extravagantly long grains, and an intoxicating fragrance. I felt like this post was meant just for me. 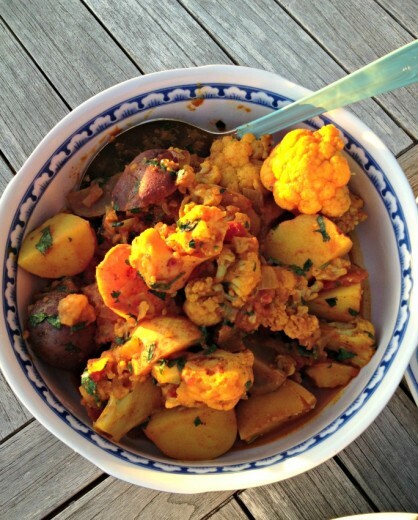 Consequently, we just finished a delicious meal of cauliflower and potato curry. Incredibly easy and so, so good. Thank you for the well-timed pep talk, Dana! There are some great tips from another commenter, so be sure to read those. I too always rinse my basmati rice (and I just buy mine from Trader Joe’s – affordable and good quality). I put it in a fine mesh strainer and really swish it around with my hands. I rinse it until the water runs clear. If I don’t feel like standing over the sink and doing that, I put it in a bowl of cold water and really agitate it, then drain it. I agree that the water proportion is 1.5 to 1 of rice. Most people use too much water. The rice I make from this same cookbook is divine so I will post that soon. 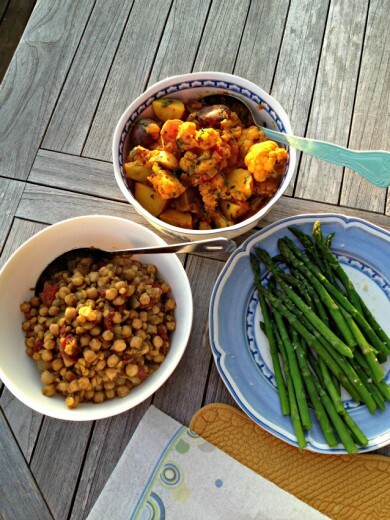 I love cooking Indian food as a vegetarian cook it is one of the most inspiring world cuisines. Madhur Jaffrey has a brilliant cookbook called curry easy which has simple Indian recipes without being dumbed down, and there are lots of Indian recipes that aren’t that complex in their spicing. I love Indian food, but I only have a few recipes that I make at home. 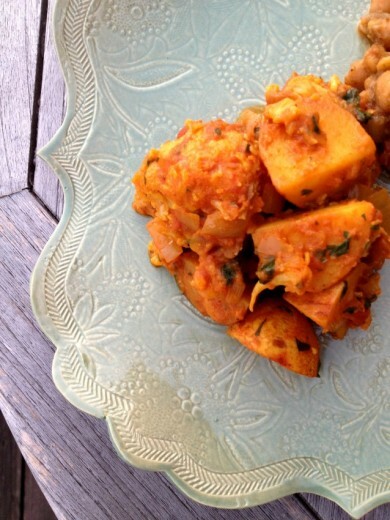 I would love to learn how to cook more Indian food so I will definitely be trying this recipe! Dana! I just broke in my brand new Dutch oven with this recipe and it is soooo yummy! It will be my quick go-to curry. Thank you! I guess this is one of the easiest way to start to make an Indian dish ..thanks for the recipe of “Cauliflower and Potato Curry”.You can also try out cooking one of the famous Indian cuisines “Palak Paneer”..Its quite easy and doesn’t take much of your time to make as well as it isn’t spicy But it tastes great! !